In the age of streaming music and digital downloads, vinyl records have made a comeback. Vinyl sales in the U.S. grew by an estimated 52 percent in 2014 to 9.2 million copies, according to a Nielsen report. The sales were the highest since the monitoring group began tracking vinyl in 1991. Local independent record-store owners said they’ve experienced the trend first hand. Vinyl doesn’t only draw customers seeking some nostalgia, it offers a warmer sound, beautiful artwork and a “cool” factor customers can’t necessarily get with digital music, they said. Record Store Day, which occurs nationwide on the third Saturday in April, has helped drive growth in vinyl. Chris Brown, an employee at Maine and New Hampshire-based Bull Moose Records, co-founded Record Store Day in 2007. Brown said they started Record Store Day to celebrate independent stores and reassure customers that stores would be around for some time. Record Store Day began with 300 participating record stores and has expanded to include more than 1,400 stores across the U.S.
Stores typically offer limited edition records, band performances and special sales during the event. Brown said the percentage of unreleased material by bands keeps rising, along with out-of-print vinyl, because of Record Store Day. The growth of Record Store Day has made the independent music store sector much more visible, Brown said. Records were a popular medium in the 1970s, but dropped because of the invention of cassette tapes and CDs. Once the industry introduced digital music, many big-box music stores shuttered because of declining sales. The draw of vinyl records is different for every collector. For some, it’s about the sound quality. For others, it’s the experience of sitting down and listening to the record. Some people also like the idea of having a physical item as a keepsake or to display in their home, similar to books on a bookshelf. It’s a way to communicate to people who we are by sharing the music we enjoy listening to, Brown said. Independent record stores accounted for more than 5.2 million vinyl sales in 2014, making up 57 percent of all vinyl sales, according to Nielsen. Kimber Lanning, owner of Stinkweeds Records in Phoenix, said the 28-year-old store has participated in Record Store Day since its inception. She said vinyl sales at her shop are through the roof. Lanning attributed the growth to several factors. Mike Casey, owner of Record Revival in central Phoenix, said he opened his store 18 months ago. He said although running a record store generally isn’t profitable, he’s noticed a surge in vinyl sales. He said his shop draws customers from all ages. He said a lot of people raised in 1970s and 1980s are drawn to records because they remember their parents playing music on vinyl. Scott Robenalt, owner of Asylum Records in Mesa, said he’s also noticed that it’s not only older generations who love vinyl, but younger generations buy records, too. “There’s a whole new generation of kids that are learning about records, which is great,” he said. Robenalt said with downloaded music, audio engineers remove the “unnecessary” sounds to make the file smaller. As a result, listeners lose 70 to 80 percent of the sound quality. Brown said there are parts of the country that don’t have decent independent record stores. He said he thinks more indie stores will shift to online ordering in the future. “What we are starting to see in the last couple of years is indie stores getting really good websites,” he said. Casey said a decent percentage of his customers order online through his eBay store. 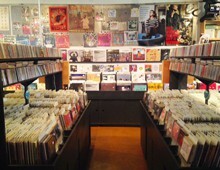 Some stores, such as Asylum Records, benefit from traditional foot traffic. Robenalt said since moving his store to downtown Mesa from Tempe, he’s seen an increase in customers. “We get 400 to 500 people a week that come in and go ‘wow, I didn’t know this was here,’ ” he said. Independent record stores across the Valley are getting ready to celebrate the love for vinyl music with the hundreds of customers expected to fill their shops on Saturday, April 18, for the seventh annual Record Store Day. Since the day began, there has been a huge increase in vinyl sales throughout the nation. Stinkweeds, a long-standing central Phoenix record store, participates in Record Store Day every year. Jack White’s “Lazaretto” sold 86,700 vinyl units in 2014, earning the top spot in vinyl sales, according to Nielsen. 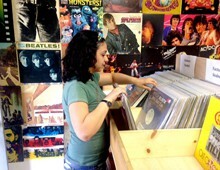 Amanda Casey, an employee at Record Revival in central Phoenix, flips through vinyl LPs.